The coat o airms o Greenland is a blue shield featurin a siller polar beir. This seembol wis first introduced in the coat o airms o Denmark in 1666 an it is still representit in the airms o the Dens ryal faimily. In a Dens context, the bear wis oreeginally shawn walkin naturally, but an upricht poseetion wis specified in 1819. The 1470 Lunnon Roll shaws an airms captioned Le Roy de Greneland featurin a shield depictin a polar beir surroondit bi three birds. This ryal title did na reflect ony offeecial title, but merely that the airms coud be uised bi onyane controllin Greenland. The version currently uised bi the govrenment o Greenland wis designed bi Greenlandic airtist Jens Rosing an adoptit on Mey 1, 1989 bi the Landsting. The polar beir seembolizes the fauna o Greenland an the blue (azure) colour designates the Atlantic an the Arctic Ocean Greenland is washed bi. 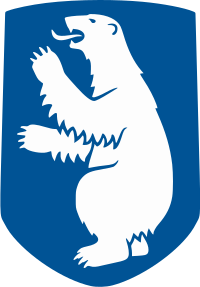 Instead o the Dens version in the ryal airms which follaes the heraldic tradeetion in raisin the richt forepaw, the polar beir on the Greenlandic coat o airms raises the left forepaw, due tae the tradeetional Inuit belief that polar beirs are left-haundit. A seemilar airms is uised bi the offeecial Dens govrenment representative in Greenland. In this case, the beir raises its richt paw, an the shield is crouned wi the ryal croun. The offeecial Dens specification o the airms daes na specify which forepaw is raised, sae thare is nae conflict atween the different versions. The adherents o the full unthirldom o Greenland uise a green backgrund. A blazon in heraldic terms is: Azure, a polar bear rampant argent. A polar beir is an aa featurt on the coat o airms o Norilsk. The polar bear wis first includit as a seembol o Greenland in the Dens coat o airms durin the reign o Keeng Frederick III o Denmark, but did na gain widespread uise on its awn till the early 20t century. Wikimedia Commons haes media relatit tae Coats of arms of Greenland.